Share the post "Flaming Red Wing"
As expected, it was a hectic Monday with phone calls, appointments, and a handful of other little to do’s. What caused me extra time and frustration, was when I went to check on one of my vacant listings, and finding the electronic lockbox on the property somehow decided to give me an error code when trying to open it with my code. Making matters even worse, my cell phone signal being nearly non-existent every time I’m at the property. Therefore, I had to run back to the office and call the company’s tech support to get that lockbox’s internal clock re-set. I did finally get into that naughty box and do my weekly inspection. And to think I was just talking about computers last evening. Late this morning I received a call from a woman on behalf of a prospective buyer of Prairie Place on 1st. All her questions were answered, as well as my adding a few more benefits the complex offers. I was happy to find she’d already looked at all the photos of the different units still available. It sounds like there’s some solid interest in them, and perhaps yesterday’s ad in the Globe Gazette created more interest from those that read it. This would be a good time for our seniors to purchase one of them since we’re still in the midst of a shortage of homes in certain price ranges. Most likely their homes would sell quickly and give them more than enough time to get settled in Prairie Place before the hard winter arrives. Just think, no more shoveling, mowing, maintenance, and repairs. There couldn’t be a happier place for a senior to be, than Prairie Place on 1st. What really surprises me, is that we haven’t had an offer as of yet on 146 – 12th St. NW here in Mason City. With it priced at $49,500, and being a 3 bedroom with all appliances included, it should have been sold to a first-time buyer by now, or even to a “flipper” or investor. It offers newer windows, oak floors, and a welcoming enclosed front porch that has a genuine red tile floor. I’m finding all the more buyers wanting enclosed front porches which is telling me they’re staying home more in the evenings and weekends. If I were looking for a first home, I’d be buying that one because it’s as solid as a rock, and offers enough room off the back alley to build a monster garage. Not to be sounding schmaltzy, but I have to tell you a little story about my infatuation with crocks which likely stems from my years as a youth when helping my mother while preparing to make sauerkraut or pickles in them. Those were hard years, but also the more heart-felt ones. I’m convinced that for those who look back on their years of struggles in appropriate lights, they’re nearly always considered the best. In a future article I’ll explain why. Some weeks ago a gentleman who was clearing out personal belongings from a home, asked that I give him my nickel price opinion on it. I walked thru it and told him a ball park price, but while standing in the garage, I happened to notice a Red Wing crock, which prompted me to ask if it was for sale. His answer was, “Everything in here is for sale.” With that said, we struck a bargain on that 6 gallon crock. I gave it a good look-over, but still wasn’t sure if it had any cracks since it was exceptionally dirty both inside and out. Well, I took it home, cleaned it up, and wouldn’t you know it, it’s about as chip and crack free as would’ve never expected, but the interesting things about it, are the visible flaws in manufacturing. It’s a 1915 model, and for some reason, you can tell that whomever was the factory worker, must’ve been on a drinking binge the night before, or possibly his first day or two at work because there are numerous flaws in its making, including an area on the inside which looks like finger pressure marks in the then raw pottery. The funniest, is the stamping of the “6” with a period before it, and the “flaming” red wing insignia. The wing looks like it’s on fire because of the smudging of paint. Its new resting place is just inside the front door of my office which should create some interesting conversation in the future. I’m glad I purchased it, and hopefully the general public will resurrect some fond memories of their own while looking at it. 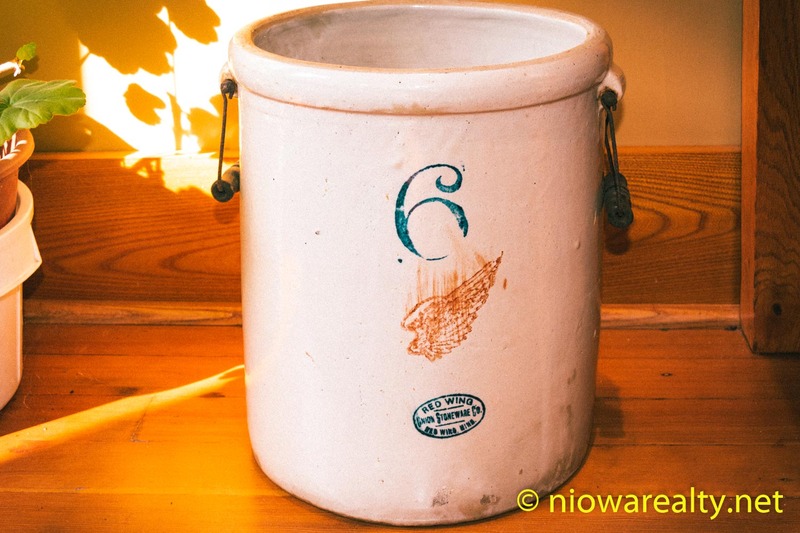 The above photo is of my flaming Red Wing 6 gallon crock. Tonight’s one-liner is: The history of innovation is the story of ideas that seemed dumb at the time.